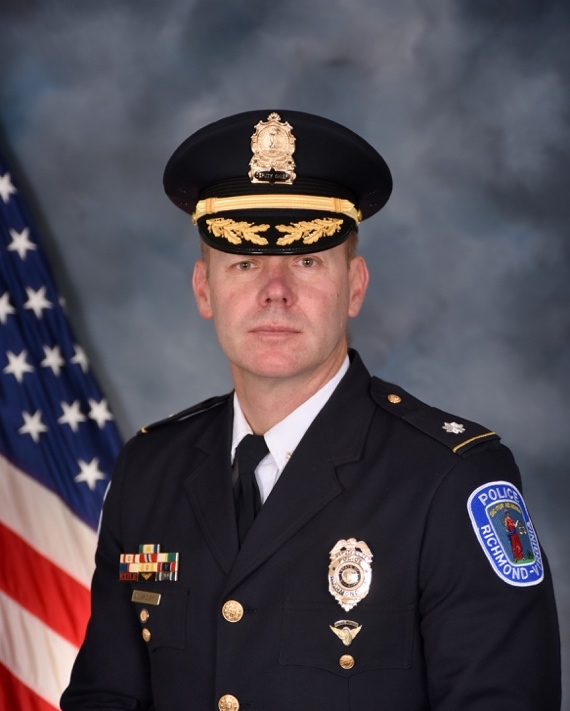 The administration of Mayor Levar M. Stoney today appointed current Richmond Police Department Acting Chief William C. Smith to serve as Interim Chief of Police following the retirement of Chief Alfred Durham on Dec. 31. Smith, 50, began his law enforcement career with RPD in 1995 and has risen through the ranks of the department over a 23-year career. He was promoted to the rank of sergeant in 1998, lieutenant in 2003, captain in 2007 and major in 2016. Smith was recently promoted to Deputy Chief and then designated as Acting Chief of Department by Chief Durham. Chief Smith will run the department until a permanent chief of police is selected. Prior to his most recent promotion, Chief Smith served as Chief of Staff for the Richmond Police Department (2017), ran Business Services (2016-2017), and the Special Operations Division (2011-2016). He also commanded the Third Precinct (2009-2011) and supervised the Division of Emergency Communications (2007-09). Chief Smith holds a Bachelor of Science degree from Virginia Commonwealth University. He is also a graduate of the Police Executive Leadership School at the University of Richmond, as well as the Senior Management Institute for Police in Boston. Mayor Stoney is proud to announce that the City of Richmond received the highest Municipal Equality Index scorecard in the Commonwealth of Virginia as determined by the Human Rights Campaign. Out of the 11 municipalities scored in Virginia, Richmond received a 94. Out of the 506 municipalities scored in 2018, the City of Richmond experienced the most significant score increase nationwide. Richmond was named a “MEI All-Star” and spotlighted as a “city boldly leading the way to equality” in the Human Rights Campaign’s 2018 MEI report. Each year the Human Rights Campaign rates cities across the United States based on their initiatives to support LGBTQ communities. This process is called their Municipal Equality Index (MEI) scorecard where cities are scored from 0-100 on items such as non-discrimination laws, transgender-inclusive health benefits for city employees, inclusive workplaces, and LGBTQ liaisons in the city’s executive office, to name a few. In 2017, Richmond received a 42 on the MEI scorecard. By working with City Council to establish a Human Rights Commission and non-discrimination laws, designating a policy advisor to serve as the Mayor’s LGBTQ liaison, and offering transgender-inclusive health benefits for city employees, Richmond was able to increase its score by 52 points since 2017. Richmond’s score increase is celebrated by state groups such as Equality Virginia, a non-profit that advocates for equality for LGBTQ Virginians, and Virginia Pride, an organization that provides support and resources for the LGBTQ community. Fortune 500 companies look to the Human Rights Campaign report as a guide to where they may relocate as they need cities that reflects their values. Local organizations have also demonstrated support of Richmond’s efforts to protect the LGBTQ community. Mayor Stoney said that the news should be celebrated by the entire city.